I’ve agreed with the late chef/traveler/storyteller Anthony Bourdain on many things but none as much as his love for Asian noodles. I’ve become entirely too predictable with my family when eating out. “You know Dad is going to want noodles,” my kids say with only a little exasperation. I plead guilty. I also think Bourdain would agree that there are worse things to be hooked on. While debate rages on about whether Marco Polo introduced pasta/noodles to Italy after his travels to China, what is not disputed is that the Chinese created noodles. The first written accounts or recipes for them date to the Han Dynasty (206 B.C.-220 A.D.). 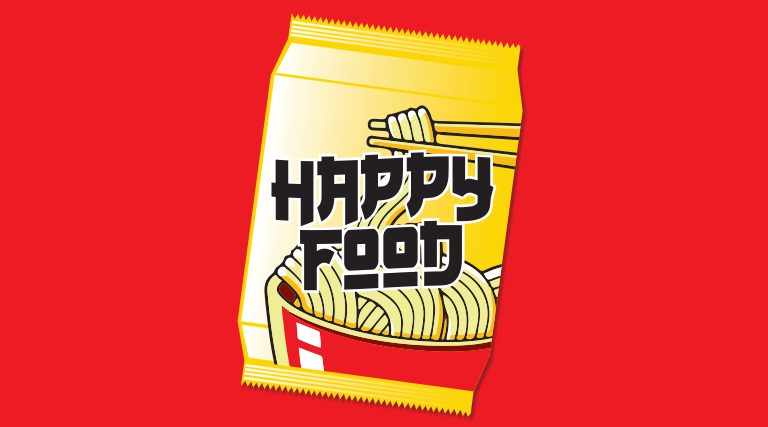 Noodles are second only to rice as a common element in Asian food culture. Collectively known as miàn (mein or mien), noodle dishes such as chow mein were among the first Chinese foods to become popular in the United States. Noodles come as varied as the countries themselves, and each region has its unique preference and preparations. While Italian pasta is typically made with semolina wheat flour and eggs, one can find Asian noodles made with everything from wheat flour to sweet potatoes and beans. While some noodles can be short and bite-size, most are long and thin, as length is an important feature. Erin Lin at Mom’s Kitchen (2233 S. State, SLC, 801-486-0092, MomsKitchenSaltLakeCity.com) in South Salt Lake said long noodles are an important part of Chinese celebrations. New year’s feasts often feature “longevity noodles” or cháng shòu miàn, prepared to be as long as possible and not cut or even chewed much to ensure a long life and prosperous new year. Noodles for the most popular dishes at Mom’s Kitchen (named for and owned by friends Mama Zhang from Beijing and Mama Chen from Taiwan) are made in-house. 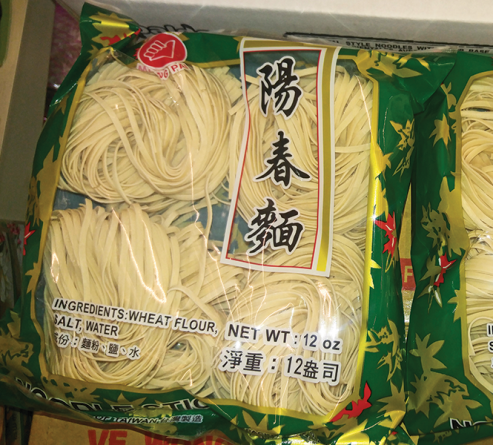 The extruded flour-and-water strands are used in cold noodle dishes like dan dan noodles and the popular Taiwanese beef stewed noodle soup. 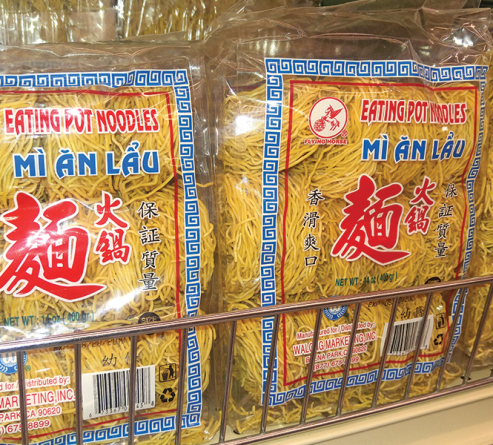 West Jordan resident and native of Taiwan Miggie Fay says beef stewed noodles are a favorite of hers to make and eat at home along with dishes using rice noodles. “In Taiwan for Chinese New Year, lots of families will cook stir-fried rice noodles,” she noted. Peering down the noodle aisle at an Asian market is a bit like taking in the breakfast cereal aisle in an American supermarket: You’ll see shelves of multicolored packages in all shapes and sizes, made from an array of grains. The first Chinese noodles were likely made from millet, a staple grain back in the day. Today, most noodles are made using wheat flour, rice, starchy vegetables and beans. There are four signature Chinese-style noodles: Lanzhou hand-pulled noodles (these springy noodles often include an alkaline component such as potassium carbonate); spicy dan dan noodles from the Sichuan Province; zha jiang mian (fried sauce noodles)—the thick wheat noodles in fried sauce popular in Beijing; and the legendary daoxiao or knife-peeled noodles in Shanxi Province. Wheat noodles are just that: made from wheat flour and water with a little salt. While there are many varieties and sizes, as a whole, they are chewy and hardy, able to stand up to sauces and be used in soups such as beef stewed noodle soup. The thinner ones can be stir fried with vegetables and meats for lo mein. Others are cooked in boiling water like most pastas. Unlike Italian pasta that is usually cooked al dente so there is a little resistance to the bite, Chinese wheat noodles should be cooked through and be easy to bite through or slurp from a broth. Some cooks add lye, egg or even shrimp to the dough, giving the wheat noodles a different texture. Some eggier versions have a yellow color and can be chewier. They are also suited to be stir fried or used in soups. These are made from cooked rice pressed into a paste and extruded into different sizes. Another method is to steam rice and make a slurry from it, then spread it onto sheets and cut it. 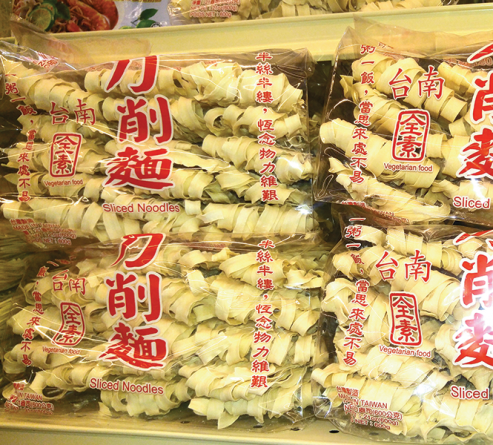 Rice noodles range in size from fat ribbons to the small rice stick or vermicelli noodles. Rice noodles have gained popularity recently since they are gluten free, hold up well in sauces and can be used in soups. The word fun in the name of a Chinese dish usually means rice noodles are used. Noodles made from the starches of vegetables and legumes are less common but have their own textures and uses. Noodles made from mung beans tend to have very little flavor on their own while those made from sweet potatoes will be earthy and sweet. These noodles are generally very chewy and gelatinous in texture.